Wow, how time is simply flying by! 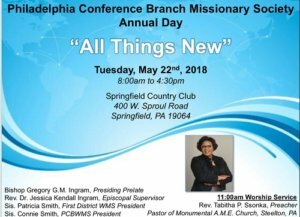 We are quickly approaching the last Annual Conference for the year which will be held in Philadelphia, PA. Did you know that this year’s Philadelphia Annual Conference will be hosted by Bethel AME Church – Ardmore and under the leadership of one of our young and outgoing Pastors, the Reverend Carolyn Cavaness. The guest preacher for our opening Annual WMS Service is another dynamic young preacher/pastor, the Reverend Tabitha Ssonka of Monumental AME Church – Steelton, PA. We are looking forward to a wonderful, spirit-filled time in the Lord. Please be sure to join us there.